The result we combined with the right Lenormand Tarot card, the cemetery. Today you must take care of accidents. Also a small accident at home or at work is possible. Today, you will make a big mistake at work. This mistake will cost the company much money. Learn out of the mistake and try to avoid it, next time. It is better, if you do not touch money, today. It is not the right day for you for dealing with money. You will make mistakes which can be very expensive for you. Today is also a risk of a small accident at work. If you just meet a new partner, then this Tarot card shows you, that he is the wrong person for you. Soon he will be boring and soon he will not make you laugh anymore. At the moment he is still nice and funny, but this will change. The Cemetery is a warning card. The possibility is there, that somebody in your social environment will get a terrible disease. But this person will recover soon. The cemetery shows us also to learn from our mistakes and accept them as experiences. 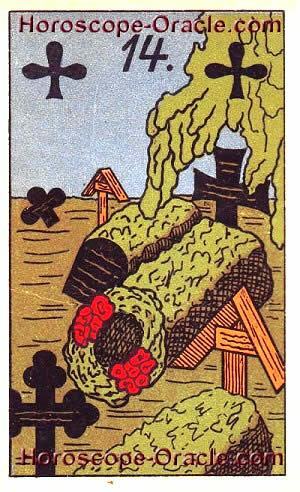 This card may also indicate that we have lost our way and we have to start again.